A complete Tour designed to explore North of Italy: from Milan to Venice this journey will lead you to an extraordinary experience and you will discover the perfect mix beetween history and spirits tastings. 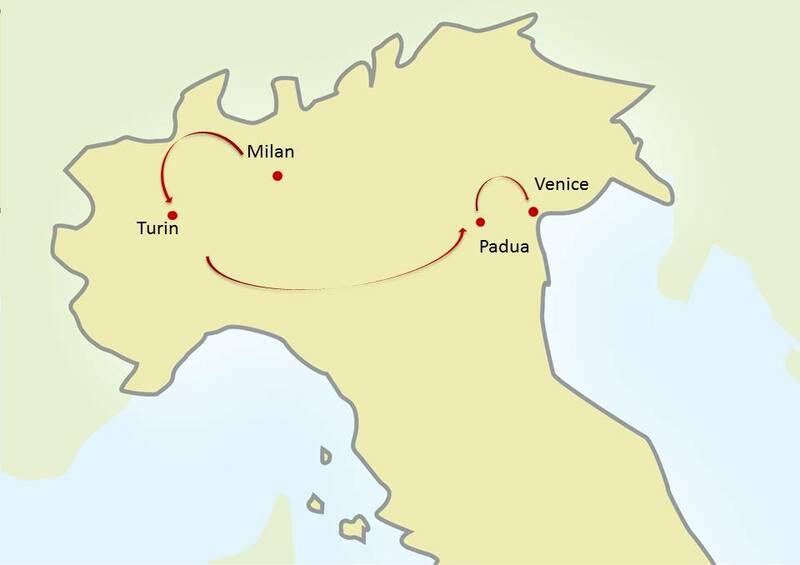 The tour features: Milan, Turin, Padua, Venice. Admire the sparkling Milan, taste a glamouros Aperitivo at Aperol's Terrace overlooking the Duomo Cathedral and take part to Campari Masterclass lesson. Walk across Turin, one of the European capitals of Baroque and visit one of the most renowned and traditional chocolate laboratories in town and make your own Vermouth Masterclass at Casa Martini. Guided visit and tasting at Grappa Poli and Luxardo then have a tour of Padua's historical centre. Discover the beauty of setting and the unique architecture of Venice and enjoy a guided tour of Venice typical Bacari. 6 Nights accommodation in exclusive and fascinating 4 stars sup. Hotels, with full buffet breakfasts: 2 nights in Milan, 2 nights in Turin, 2 nights in Venice. Typical Italian Aperitivo at the Terrazza Aperol in Milan. Lunch at Villa Campari and at Casa Martini near Milan. Cocktails Masterclass at Campari Academy and at Casa Martini in Turin. Guided visit to a Chocolate Laboratory (tastings included) in Turin. Guided visit and tasting at Grappa Poli and Luxardo near Padua. Private boat tour on the Grand Canal with English speaking guide. Start exploring the city at your own leisure. In the evening you'll taste an unforgettable Typical Italian Aperitivo on a terrace of a Glamorous cocktail bar overlooking the Duomo Cathedral. Private guided tour of the city highlights : Cathedral, Galleria Vittorio Emanuele, Piazza della Scala, Castello Sforzesco and the Last Supper by Leonardo. A very special lunch at Villa Campari and a Campari Masterclass will amaze you. Explore the highlights of the capital of Piedmont region. At the end of the day, a guided mouthwatering visit to a Chocolate Laboratory (tasting included). Spend the whole day at Casa Martini: first Wine Museum & Botanical Room, The old laboratory, and The Mondo Martini Gallery then a full immersion Vermouth Masterclass. At the end, you will taste a delicious lunch at Casa Martini. During the transfer, you will visit 2 outstanding local producers of spirits: Poli Distillery, a local producer of grappa and Luxardo, one of the oldest European firms producing liqueurs. Sip an Aperitivo with Spritz cocktail in the historical center of Padua for lunch. Classic Venice private walking tour, discovering the beauties of this city. Explore the most authentic areas of Venice and enjoy the lively atmosphere of typical Venetian wine bars called "Bacari".